McLaren Automotive today reveals the stunning, streamlined form and sensational specification of the McLaren Speedtail. The next chapter in McLaren’s Ultimate Series, the Speedtail is the first ‘Hyper-GT’ from the pioneering British company recognised for producing luxury sportscars and supercars that deliver extraordinary driving experiences. The Speedtail can achieve the highest maximum speed of any McLaren to date, reaching 403 km/h (250mph), yet will also deliver an unprecedented blend of contemporary craftsmanship, materials innovation and bespoke personalisation. Just 106* will be created and all are already reserved, at a price of from £1.75million plus taxes. 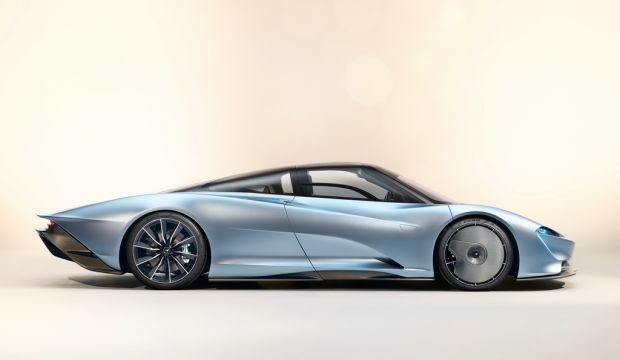 The hybrid powertrain enables a relentless increase in vehicle speed regardless of engine rpm and the low weight of the Speedtail – only 1,430kg dry – hastens this ability. The straight-line acceleration of the Speedtail sets a new benchmark for a McLaren, with 0-300km/h (0-186mph) achieved in just 12.8 seconds; McLaren Automotive’s previous Ultimate Series hybrid, the McLaren P1™, could reach this speed in 16.5 seconds. A bespoke P-ZERO™ tyre designed for the Speedtail’s extreme speed has been developed with McLaren technology partner, Pirelli. Being at the wheel of a Speedtail promises to be a truly sensational experience and unlike that enjoyed in any other car. The driver is positioned centrally in the luxurious cockpit, with seating for two additional passengers set slightly rearwards. There is luggage space within both the nose and tail of the vehicle and a bespoke luggage set is available to every owner, the carbon fibre, leather and metalwork on the cases being matched to the interior specification of their Speedtail. Speedtail depositors were invited to view a design model of the car at a recent private preview event held in London. Resplendent in Speedtail Silver, a Nano-metallic, ‘molten-effect’ paint developed by McLaren specifically for this car, the model displays both aniline leather – a leather dyed with soluble dyes to retain the hide’s natural surface – and a new lightweight leather. The cockpit provides enticing glimpses of the astonishing level of personalisation opportunities available; with each Speedtail being tailored to the owner’s individual tastes by McLaren Special Operations (MSO), the division of McLaren Automotive responsible for bespoke customer commissions, it is virtually certain that no two examples will be identical.